March is the beginning of "pot smoking season." 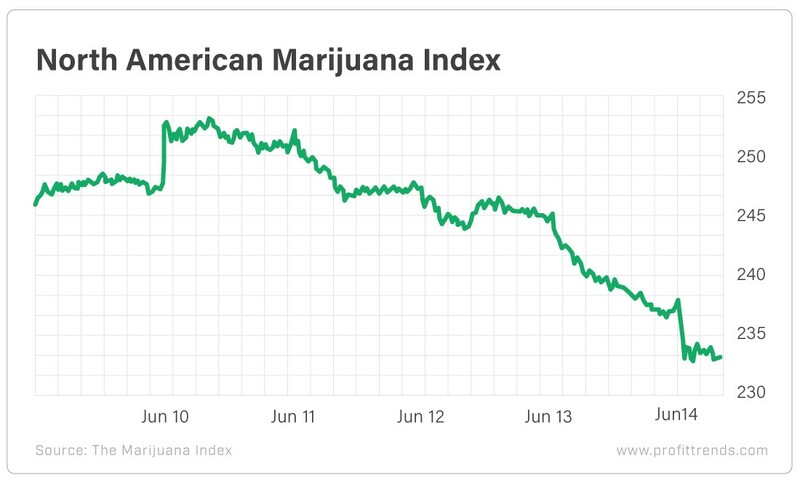 But so far, March hasn't been kind to anyone... especially cannabis companies. On top of that, we had a number of headline moves - including that pervasive trend of mergers and acquisitions. Aurora Cannabis (NYSE: ACB) bought Cronos Group's (Nasdaq: CRON) 19% stake in Whistler Medical Marijuana Corp. for $131.4 million. Recently, Choom Holdings (OTC: CHOOF) agreed to acquire Clarity MD Cannabis Holdings. This gives Choom 30 retail locations, with three licensed by the Alberta Gaming, Liquor & Cannabis Commission. Aurora has invested $27 million in Choom since June 2018. Then we had Altria's (NYSE: MO) 45% stake in Cronos close with new executives named. Finally, we saw the nascent nature of the industry on display as well. Shares of Village Farms International (Nasdaq: VFF) were uplisted but resumed trading on the Nasdaq after having been halted for a few days. With the recent pullback in pot stocks, my team and I decided to turn to the relative strength index (RSI). This momentum indicator measures the magnitude of recent price changes. An RSI reading above 70 is considered overbought (or overvalued). A reading below 30 is oversold (or undervalued). But we also want to look at a company's RSI compared with its industry's rating. 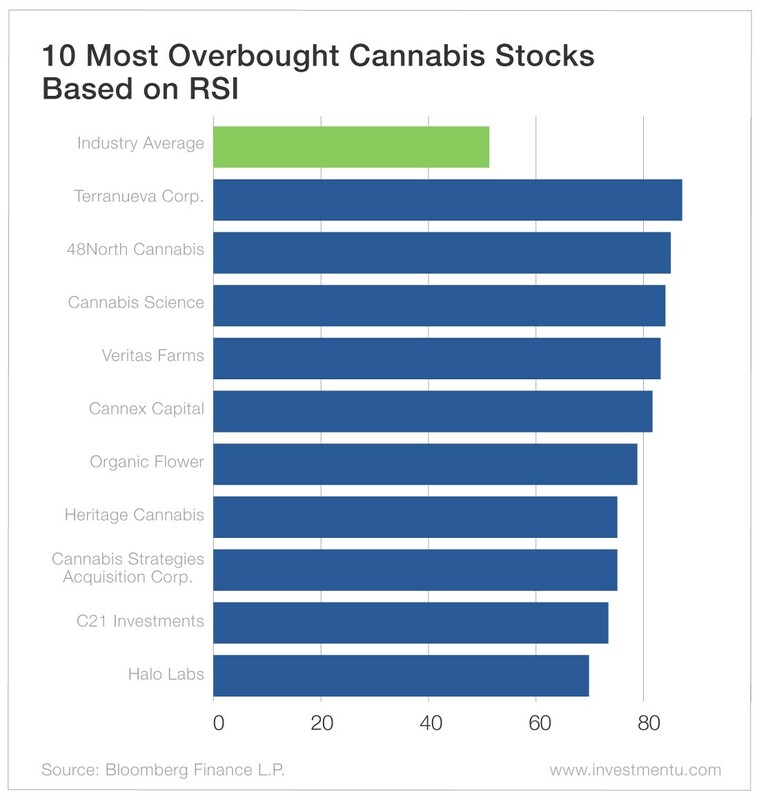 About a month ago, we found that the average RSI for pot stocks was about 55.9. Today, it's a bit lower at around 51.5. Terranueva Corp. (CSE: TEQ) tops the list of most overbought stocks. Shares have been on fire, surging more than 100% year to date. Heritage Cannabis (CSE: CANN) is another stock that's blown up this year - jumping nearly 250% so far. 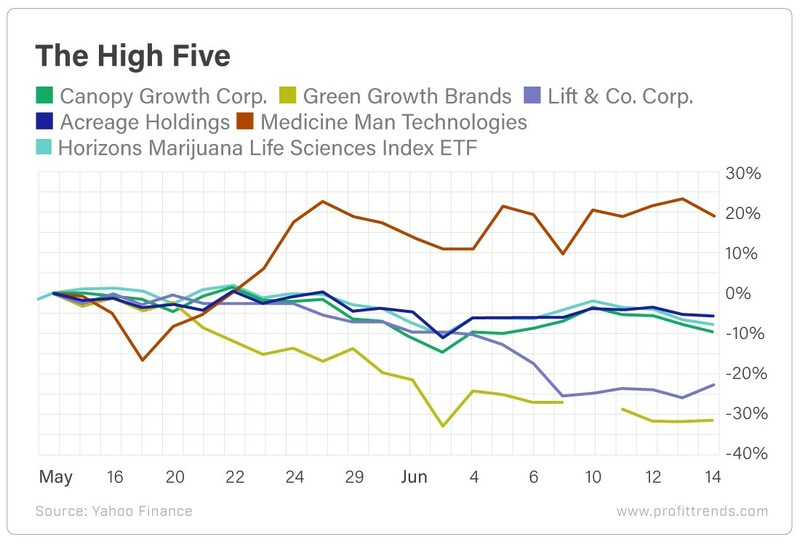 Compared with other high-flying pot stocks, companies like NewBridge Global (OTC: NBGV), Green Growth Brands (OTC: GGBXF) and Wayland Group (CSE: WAYL) have posted disappointing performances. 1) Acreage Holdings (OTC: ACRGF) is the largest multistate operator in the U.S. It has licenses in 19 states with a projected total addressable market of $14 billion by 2022. In the third quarter of 2018, revenue surged 160% to $5.5 million. 2) HEXO Corp. (NYSE: HEXO) saw adult-use revenue surge 371% in the first quarter of 2019. Sales volume increased to 952,223 grams, with 81% of that being dried flower. As happened to a lot of Canadian producers on that first report after legalization, HEXO shares dipped because of the smaller profit margins on dried flower. The company also saw 90% of its sales come from Canada. 3) GrowGeneration Corp. (OTC: GRWG) acquired Reno Hydroponics last month. But that was one of four acquisitions the hydroponic and organic gardening chain has made in 2019, including three in February. But GrowGeneration is bullish on Reno because of the Nevada cannabis market. There are 50 legal cannabis establishments within 100 miles of Reno. The company's two other acquisitions last month were in California and Colorado. And in the third quarter, GrowGeneration's revenue jumped 109% to $8.4 million. The acquisition of Chlorophyll Inc. in Colorado is expected to add $8 million in revenue to GrowGeneration. 4) Cannex Capital Holdings (OTC: CNXXF) shares surged earlier this month. 4Front is merging with the company. The new entity will trade under Cannex's ticker on the Canadian Stock Exchange. This deal was originally announced back in November. Back in January, Cannex reported second quarter revenue surged 223% to $3.05 million. And since then, the company has announced a couple of acquisitions, including Pure Ratios, which gives Cannex exposure to the ultra-hot CBD market. 5) Halo Labs (OTC: AGEEF) kicked off March by reporting record revenue in February. The extraction company reported $2.6 million in sales last month. And California represented 60% of that total. CEO Kiran Sidhu said, "We are laser focused on the massive opportunity we believe we have in the state of California." Overall, this month has been a tough one for the markets and for pot stocks. The Horizons Marijuana Life Sciences ETF (OTC: HMLSF) slipped more than 5% as the broader indexes struggled to keep their footing. Acreage, HEXO and GrowGeneration have lagged the Horizons Marijuana ETF in 2019. But as we showed above, Acreage is in oversold territory. Meanwhile, Cannex and Halo have doubled the performance of the ETF, soaring more than 100% already this year. 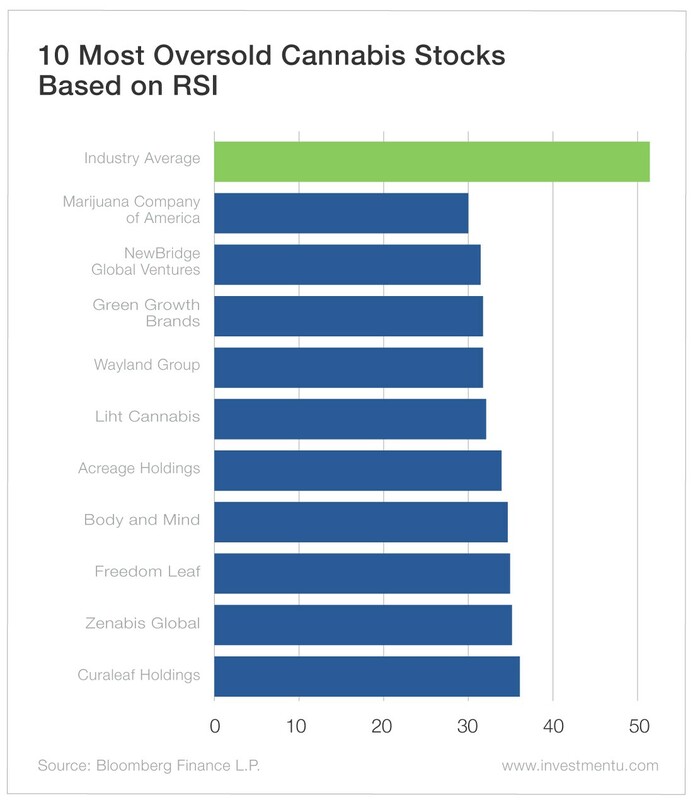 These two also appeared in our list of 10 overbought cannabis stocks based on RSI. But that doesn't mean there isn't anything left in the tank. Investors might want to wait for a pullback to make a splash in those two. The broader markets got tripped up earlier this year over U.S.-China trade deal hopes. And even though that has nothing to do with the marijuana industry, speculative investments like cannabis will be hit by increased volatility. Remember that these dips can provide better entry points... especially if technical indicators like RSI tell us the stocks we're watching are oversold.